We offer high grade zinc plating to our clients. 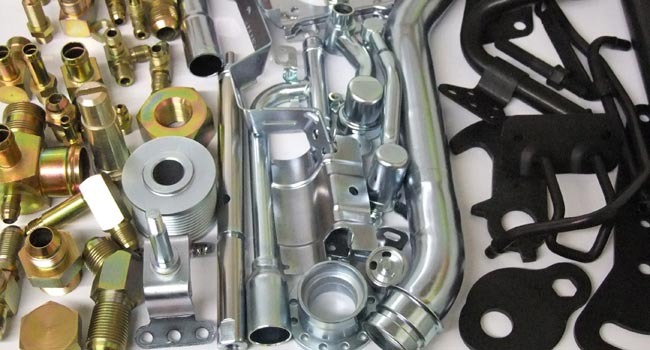 For this purpose, we use environment friendly non cyanide zinc process to ensure high quality plating. We ensure different colors such as blue, yellow, and black as per requirements of our clients. Zinc coatings prevent oxidation of the protected metal by forming a barrier and by acting as a sacrificial anode if this barrier is damaged. Zinc oxide is a fine white dust (in contrast to iron oxide) does not cause a breakdown of the substrate’s surface integrity as it is formed. Indeed the zinc oxide, if undisturbed, can act as a barrier to further oxidation, in away similar to the protection afforded to aluminum and stainless steels by their oxide layers. Withstands neutral salt spray more than 100hrs (white rust). · Contains no hexavalent chromium. Cost. · Provides good corrosion resistance. · Can cause existing equipment and Process cycle. · Increase in productivity. Frequency. · No extra expenses. Easy to change over. · Meets the automobile requirements. Oil and gas: valve components,such as balls, gates, plugs etc. and other components such as pumps, pipe fittings, packers, barrels etc. Chemical processing: heat exchangers, fitter units, pump housing and impellers, mixing blades etc. Plastics: molds and dies for injecting and low and blow molding of plastic components, extruders, and machine parts rollers etc. Textile: printing cylinders,machine parts, spinnerets, threaded guides etc. Automotive: shock absorbers,heat sinks, gears, cylinders, brake pistons etc. Aviation and Aerospace:satellite and rocket components, rams pistons, valve components etc. Food and Pharmaceutical: capsule machinery dies, chocolate molds, food processing machinery components etc. No costly additional equipment required. Easy waste treatment. No complex procedures involved. Do not require special chromate only adjustment is required.